Awhile ago, as in quite some time ago (YEAR 1 BB: Before Baby), we did some upgrades to our house including a new coat of paint in the master bedroom. At the time, we had to decide which wall hangings we wanted to keep, and which we planned to remove so that the holes could be repaired and painted over. Since we had delayed painting this room since... ohhhh... the day we moved into the house, there was lots to be addressed, from both the previous owners and from ourselves. We had a small gallery wall on one side of the room, but after we upgraded our furniture and mounted a mirror above the vanity on that same wall, the arrangement of the gallery wall felt unbalanced. So, we decided to redo the decor arrangement there. However, between pregnancy fatigue, decorating a nursery, new parent fatigue, and so on, the gallery wall project in our master bedroom was left undone. Additionally, I found that there were two challenges with this project I kept coming up against, and I wanted a clear (and rested) mind to make the decision on how to decorate it so that it was right this time. First, the mirror along that wall hangs lower than a dresser mirror by a few inches, with the dresser alongside it sitting higher. Finding the right arrangement of photos (width and height) would be key to ensuring the space felt balanced and "level" to some degree, while not minimizing the height of the ceilings. Secondly, gallery walls always make me nervous because I don't want to change my mind after a few weeks and have to figure out how to re-arrange photos, or potentially drill a new hole in the wall. Some gallery walls opt to use the picture mounting velcro, but I knew I wanted to use at least one larger frame that would likely exceend the weight capacity for that method. After much consideration, we decided to do a Picture Ledge Gallery Wall so that we could easily rotate the photo and frame arrangement. The picture ledge also allowed us to raise the height of the gallery wall above the dresser a bit to make space for a small fan, and doubled as a means to make the photo frames feel level with the mirror next to them on the wall. We have also opted to do more traditional gallery walls in our home in other locations, namely a small one by our front entrance. Each of the photos does have a hook behind it mounted it onto the wall. The real trick with planning these gallery walls it to cut out some frame-sized rectangles from brown kraft paper and mount them with tape as you have visualized the layout of frames onto the wall to see if it still looks good once it's up there. From that point, you can determine where the holes should go in the wall. A really excellent article about this method is covered in-depth on momtastic.com - so be sure to check that out if that is the look you are going for. However, this time around, I knew that I might eventually want to change things up a bit over time since a bedroom is a more casual and relaxed space. For example, I could include pictures and other small decor items (signs, letters, etc.) if I found things that I wanted to add to the space over time. This time I opted to create a gallery wall with a picture ledge. I had a few large frames, so I knew that I wanted to use one large frame as the centrepiece, and smaller ones around it. Decide what you want your gallery wall layout to look like. You might only want one picture ledge (as I did, to avoid making a pre-existing wall hanging look unbalanced). You can gets lots of ideas of what you might be drawn to by looking online at different layouts and arrangements. You might also want to look and see what photo frames you already own too (don't worry about colour - you can always spray paint them if you want them to match!). In my case, I knew I had one very large photo frame I wanted to incorporate, and then I worked from that point onward. I next considered the arrangement in relation to other elements on the wall (like the mirror next to where the gallery wall would be). Lay it out. When buying the picture frames, I actually laid them out on IKEA's floor. The staff there didn't even blink - clearly I'm not the first one. When I was home, I did this again, to ensure it was what I was looking for. Also, since I wanted the tallest point of my gallery wall to be level with the mirror that was already hanging on the wall, I needed to measure how high the large picture frame was when it was sitting in the ledge, so that I could do the calculations and determine where on the wall the picture ledge would be mounted (height of mirror <minus> height of picture frame in ledge). Mount the picture ledge to the wall. Once I knew the height I wanted the picture ledge to be placed at, I used my laser leveler and pencil to make a few markings (measuring three times to be sure!!). I found that a laser level is the absolute best way to check and double check that you have your spots marked correctly, especially when you know they need to be lined up. Also, my laser level has a built in stud finder to ensure I'm not drilling into the wood stud when I expect drywall only (and need drywall) for the anchors I want to insert. Once your spots are marked, drill into the wall at the designated spots. 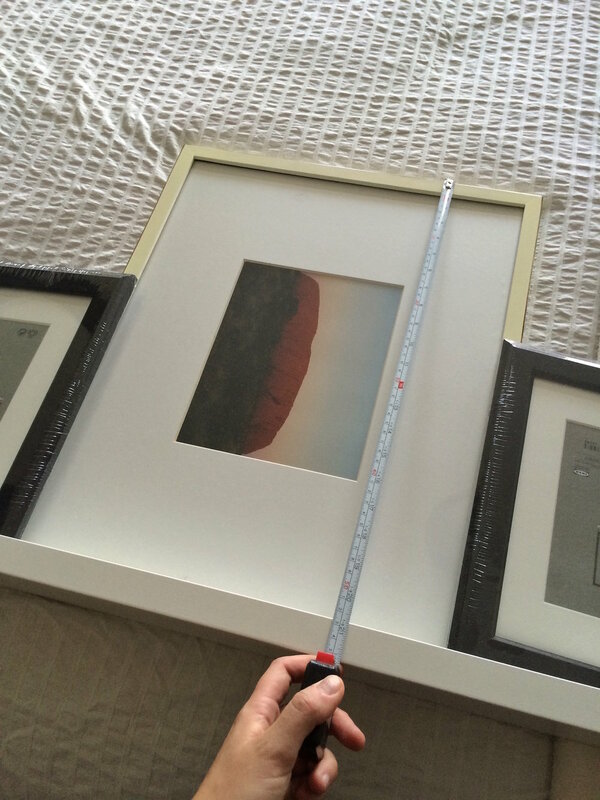 (You may have more than one picture ledge that you want to mount, in which case you would need to continue measuring and drilling additional holes at this point.) 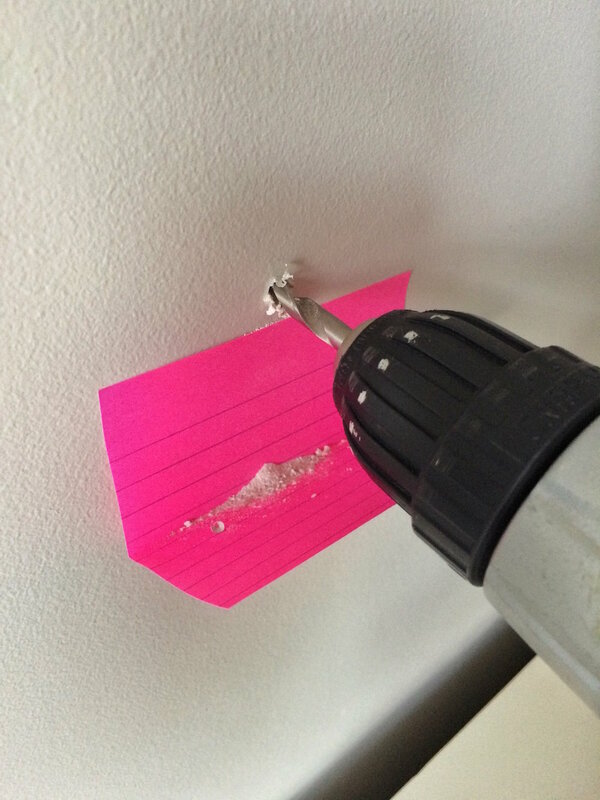 Neat trick - use a folded post-it note under where you are drilling and it will catch all of the dust! Yay for instant cleaning! I then used the rubber mallet to insert the wall anchors, and I then drilled the screws through the shelf and into the wall. I double checked to make sure that the shelf was level. If it's not, make sure all of your screws are tightened. Insert photos into the picture frames. I will also admit that trying to find a collection of photos to have printed for the frames that had similar colours and the right frame orientation probably took me longer than the rest of this project! Picture arranging time! First make sure your picture ledge is secure, and then place your framed photos onto it, as you had planned - or you can change them up a bit too! Enjoy - you did it! Do you have any gallery walls in your home? What are your best tips?